Black Friday and the holiday season are right around the corner. It’s the best time for ecommerce businesses to maximize online sales. But with cart abandonment rising in figures and hitting hard during the festive season, retailers need to find ways to ensure higher checkout conversions. After investing lots of time and money into perfecting your products and putting a ton on marketing to attract visitors, one question remains. Are the shoppers checking out? 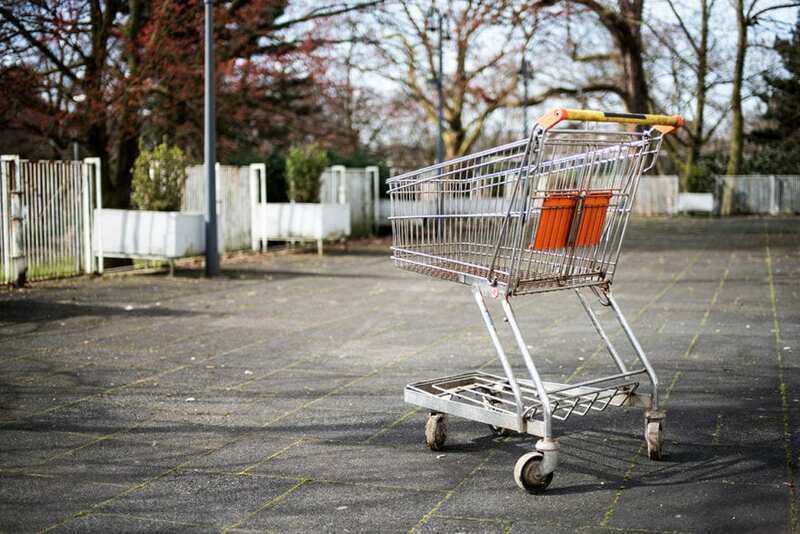 According to Baymard Institute, the average shopping cart abandonment rate is about 70%. Checkout conversion is undeniably the most critical metric in any ecommerce business. If your shoppers don’t complete their purchases, none of the rest really matters. The success of your ecommerce website depends on the sales you make, not on how many people you can attract to your site. Because the checkout page is where it all happens, every extra field is critical and might be the thin line between leaving the cart and the possibility of a purchase. Only ask for data you absolutely need. Remove all distractions and unnecessary elements such as optional fields that’ll delay the customers from finishing the transactions. Provide less controls and screens to allow shoppers to focus. Amazon does this well with their one-click purchase button that speeds up the checkout process, and with the introduction of Amazon Dash, shopping is just a push of a button. Generally, everyone remembers their passwords and pins on essential things: online banking, credit cards, work logins, etc. But when it comes to shopping online, with a billion of ecommerce sites, chances of remembering the password after a purchase made a few months ago, are very slim. Most probably, they won’t even recall creating an account. Password reset processes can be quite difficult and unnecessary at times. It can be just a simple email message with a link that lets the customers click on it and reset the password. The ultimate goal is to get the customer through the payment process with minimal friction. If there are too many pages, the process is slowed down and potential customers get confused. The more pages they go through to buy an item, the more chances of cart abandonment. If buying a pair of shoes or a handbag requires real effort and a lot of personal information to give out, most people get demotivated and just leave the page. If there’s a need to ask for additional information, it helps if there is an explanation as to why it’s required, like a phone number to send the message to when the order is dispatched. The checkout has to be quick and straightforward. You should conduct regular usability and UX testing. It’s good to observe users consistently and continuously improve based on the data gathered. From time to time, test the entire shopping funnel to see, for example, how easy it is to go back and forth between different steps. Going through the checkout funnel fast and effortlessly ensures a low bounce rate. Most businesses are seeing more traffic coming in through mobile. With this, ecommerce optimization in mobile should be as crucial as in desktop. But it shouldn’t be treated the same way. A responsive design is a good start, but it shouldn’t stop there. Mobile shoppers are usually on the go, for example, on their way home, or waiting for a meeting or conference to start. They love multitasking, so the user experience has to be catered to their unique behaviors and emotional needs. Smart and streamlined mobile checkouts have no unnecessary elements and useless content. Have a prominent CTA button that helps create a sense of urgency, which is good for shoppers who are always in a hurry. A “Save for Later” button lets shoppers save what they put in their cart and continue shopping later on. There’s no harm in offering special incentives, such as coupons and other discounts, only for those who do the mobile checkout. 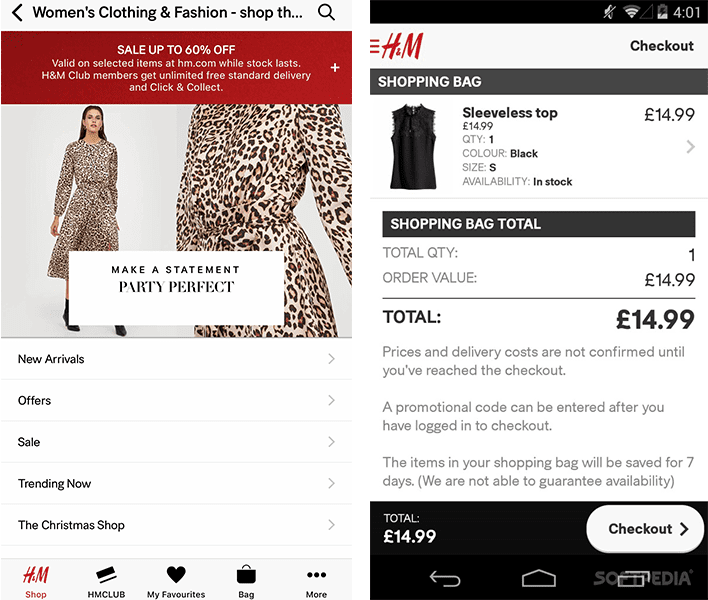 H&M has an excellent layout for mobile checkout. They offer discounts exclusively for mobile users once in a while, and they also allow existing customers to keep the items in their baskets for a few days. Users generally perceive the security of the whole purchase flow with how visually secure the checkout page looks like. The causes for suspicion can range from outdated layouts to missing images and no SSL certificates. More of a gut feeling, they usually rely on authentication and security logos like ABTA and ATOL for travel or the VISA logo for general ecommerce websites. The security badges should be clear and visible. A lock symbol in the address bar also indicates security. Potential customers want to make sure that their financial information is in the right hands. They have a peace of mind and feel safer when they know that if anything goes wrong, their money will be refunded. When users are concerned about security, it generates a bigger audience. This makes sense. One says something, and it spreads like wildfire. There should be proof to assure customers that they can trust your store. Be sure to have customer testimonials and product reviews. These show that there are real customers who have bought the products and had good experiences. 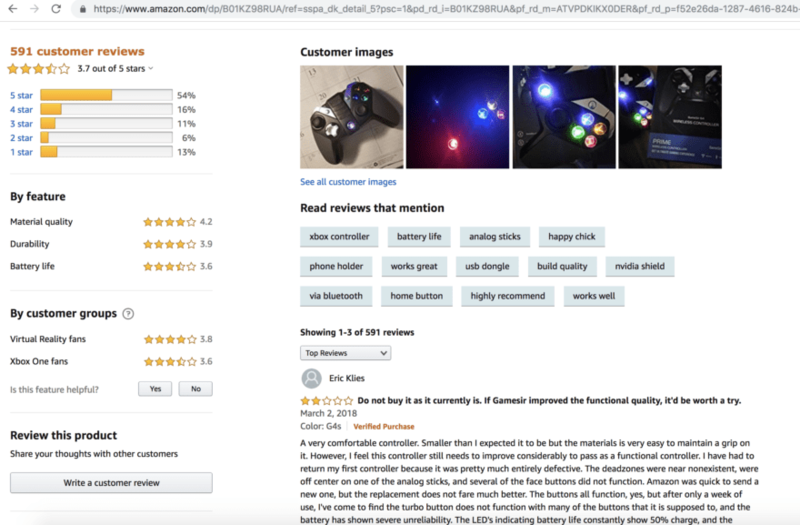 Amazon is famous for its extensive customer reviews and product ratings. After the customer enters their shipping address, you should verify that the input is correct. This creates a win-win situation for the retailer and customer to ensure there will be no shipping problems because of a faulty input of address. Be transparent on the fees right away. Ensure that shipping fees, taxes, and other costs are visible throughout. Shoppers highly value transparency. Any hidden costs, such as taxes, are major turn-offs. At the same time, make sure that the return policies and other detailed shipping information are also easy to find. If finding the delivery information proves to be a treasure hunt, customers may get frustrated and just give up. Customers should be able to know and understand when approximately will they receive the items and what to do if they aren’t too happy about them. Delivery information: How long will it take to arrive? Do they deliver to the house or is it pick up from the post office? Delivery cost: What are the shipping costs? 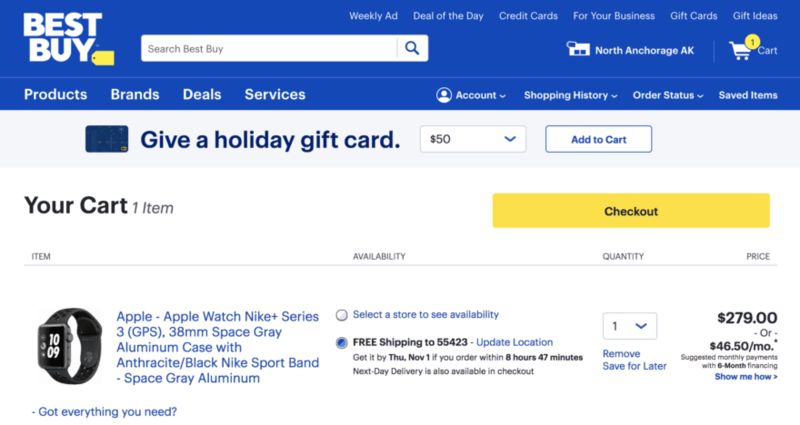 Best Buy, an online electronic store, shows delivery information and offers other shipping options and payment options. When the customers have a clear picture of the delivery information and the price of the product they want, it’s easy for them to decide whether to go through with the purchase. One popular motivation is free shipping. It gives a clear advantage over competitors when the prices are almost the same. Deemed critical to most customers, this strategy encourages shoppers to buy more and take advantage of free shipping. When the shopper adds a product to the basket, give them the right information to eliminate confusion and shorten the time spent in making the purchase. Going back and forth to check what product has been placed in the basket is a waste of time. Show them the details about what they are buying, stock availability, and add images of the products. Immediate access to this information reduces anxiety and eliminates surprises. If you wait in a line without knowing how long it is going to be, will you still queue? Probably not. Let your website visitors know where they are in the checkout process. You can break the checkout process into different sections and steps to let them know exactly where they are and how long is it going take them to finish the purchase. For example, steps should be labeled clearly. If shoppers are on the first step of a 5-step checkout process, make sure “Step 1 of 5” is clear and visible at the top of the page. This will let them know how much time they need to complete the checkout. If possible, limit the steps because the fewer steps needed, the more checkouts will be completed. A clear call to action isn’t only for those who aren’t so tech-savvy. Telling customers exactly what to do reduces confusion and provides better options for what you want the customers to do next. For example, if they add an item to their basket, there should be “Continue Shopping” and “Continue to Checkout” buttons. Avoid vague CTA’s like “Proceed” or “Continue”. If your customers see that they need to create an account before they can buy just a pair of shoes, they probably back out. There’s still an old mindset of equating account creation to filling out endless forms for information that are most of the time unnecessary. People don’t want to be forced to create an account. Now there are faster registration options, like Facebook or Google login. Customers need to have the option of checking out as a guest, especially for single item purchases. Signing up is a time-consuming effort, and if this is the first purchase from your website, and probably the last, customers are questioning the worth of spending a lot of time filling out those fields. Giving out an email address usually translates to receiving marketing messages, which customers consider as spam most of the time. 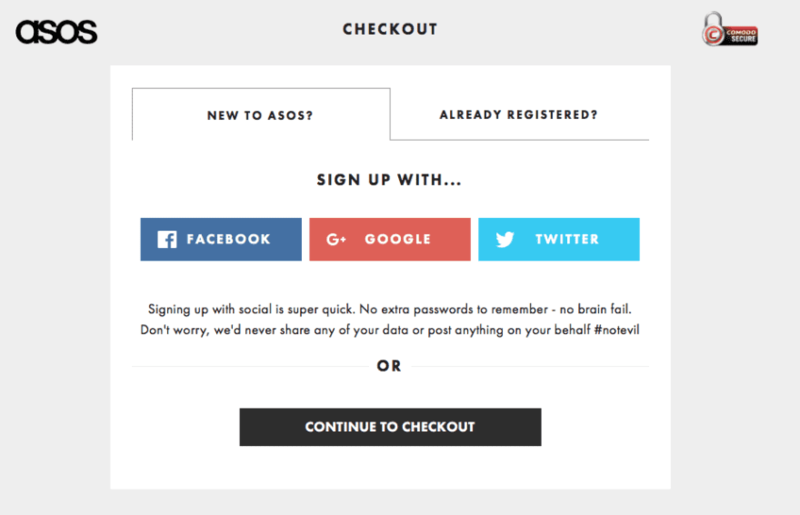 Asos, an online retailer, offers the option to checkout using social accounts. Now, what’s the easiest solution? Give them an option to check out as a guest. After that, just have a button for the password to create an account. A simple button can work wonders, as in the classic story where removing forced registration led to a $300 million increase in sales. But of course, it shouldn’t end there. After the purchase has been made, give them an option to create an account and tell them why they should. It could be for them to be able to track the order, or get a special discount on their next purchase, or to be able to buy like a breeze next time. Integrate loyalty awards. Some customers chase deals, and that 10% off on the next purchase might just be the ticket to getting one guest checkout land as a regular customer. Letting shoppers abandon their carts is one thing. But not trying to win them back is another. A website visit normally starts with “window shopping”, and it’s in your hands to turn random visitors into buying customers. Customers may add items in their baskets but, when life gets busy, they leave abruptly and forget all about it. A brief but impactful email is an excellent way to remind customers to come back and purchase their items. Most customers are more likely to come back if a company sends abandoned cart emails. At the same time, you can also let them know that their items will stay in the shopping carts for a certain amount of time, say two weeks, in case they decide to come back and purchase them. Imagine a customer going back to your site after a day or two to finish the checkout, only to find out that all the items in the shopping cart are gone, and that they have to put everything back in the cart. A thank you page is not only good for showing the order information. It is also the perfect place to do upselling. Amazon does this well with their ‘other people also bought these ’ strategy. Sweeten the deal by offering additional products that complement the item that your customer wants to buy. For example, for a dress, provide options for shoes and other accessories that match the dress. Personalized recommendations offer a more personalized shopping experience, leaving customers feeling more valued. Don’t let them leave just like that. Use an exit popup when the customers attempt to leave without purchasing. Give them a reason to complete the checkout process. Offer discounts, a coupon code, or some freebies. This is one example of an exit intent popup that offers a discount when one signs up for the newsletter. The journey to improving checkout conversion rates isn’t easy. But with the right combination of creativity, hard work, and investment, optimizing your checkout page can bring amazing results. Keeping customers happy does not need to be that painful. The key is to understand why they abandon their carts and attempt to win them back. No need to beg, let your website do the talking. Eventually, you will have a loyal customer base that trusts and highly recommends your website and a high conversion rate. Learn how you can improve your checkout conversions with Frosmo. Harness machine learning to create recommendations that can be used in many different channels. For more information, watch the Frosmo webinar ‘Introducing recommendations’. 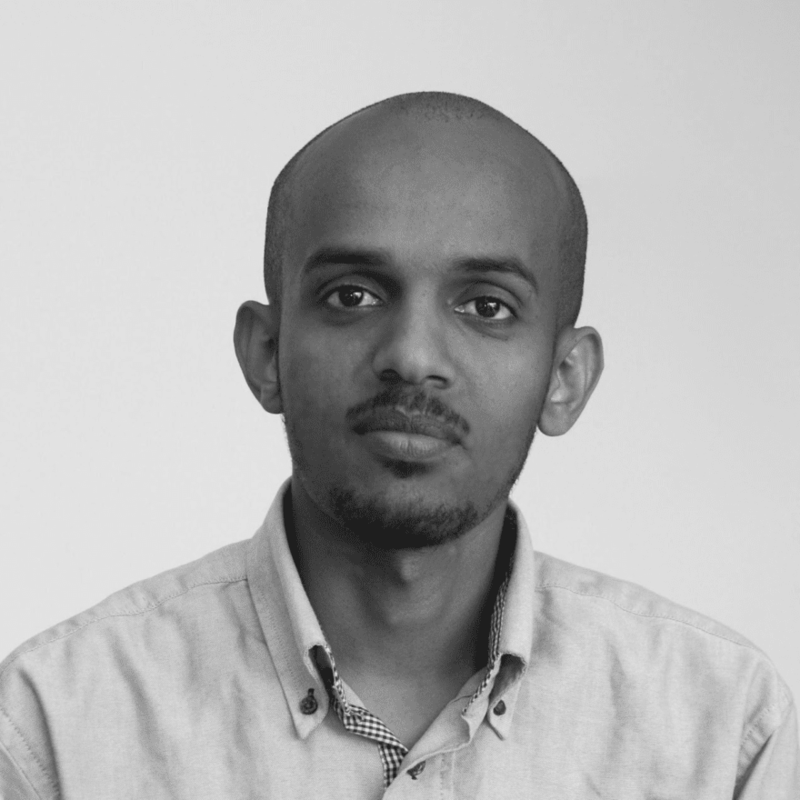 Michael Tilahun has worked as software developer for the last 6.5 years. He is driven by his unrelenting pursuit of transforming ideas into products that help people and make a difference. 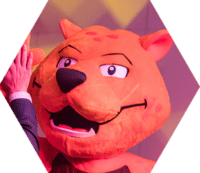 His degree in Industrial Management, Master of Engineering, gave him a full understanding of the full cycle of software development, from design to deployment. His interest in UI/ UX lets him explore possibilities of executing solutions on his own projects.